In this three part series, the Energy Efficiency Influence Team at Schneider Electric India will discuss possible bottlenecks impacting the growth of the green building market in India. In the first part, we will introduce a new metric that we have developed– namely, square foot per accredited professional (AP) and its possible implications. In the second part, we will identify the key stakeholders in the building construction market in India and the role they could play. Finally, we will discuss what Schneider Electric is doing in India to promote the growth of green buildings. What is the Square Footage per AP for your green building rating system? India has three major green building rating systems: US Green Building Council (USGBC) LEED, Indian Green Building Council (IGBC) LEED, and Green Rating for Integrated Habitat Assessment (GRIHA). 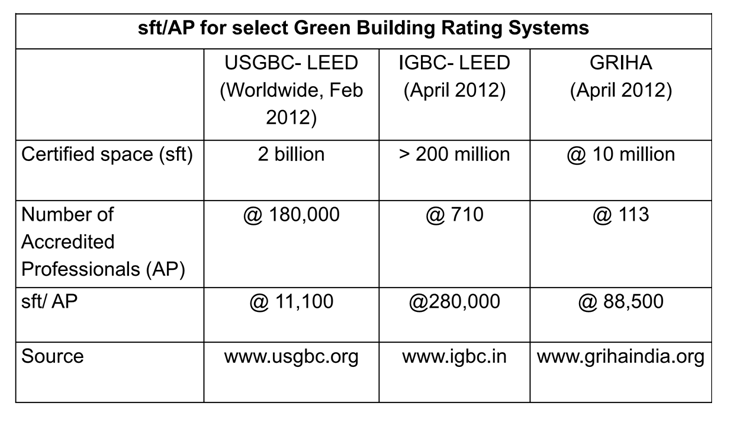 Of the three, IGBC -LEED is the most commonly followed rating system. We estimate that the footprint of projects that have received a LEED certification in India is around 200 million square feet. Similarly, the footprint for certified GRIHA-rated buildings is close to 10 million square feet. While these numbers are not small by any measure, they represent a minor percentage of the square footage of buildings in India. So what is preventing a wider acceptance of green buildings in India? Depending on whom you talk to, the market for green buildings in India is either “rapidly evolving,” “niche,” or “not for me.” During discussions with many real estate developers, we often hear that quite a few of them are aware of the benefits of green buildings, but the common reaction is “the tenants will enjoy the benefits of lower energy bills, but we do not get any premium on the rent. Moreover, the government agencies or the financial markets do not provide any incentive either.” While these are genuine concerns, we wonder if these are the only reasons that are constraining the growth of green buildings. In order to identify what some of the other factors could be, we looked at the growth of the green building market in India, and compared it to the growth of USGBC-LEED globally. We also looked at the square footage of certified green building space and the number of accredited professionals under the three building rating systems. Based on our analysis, we have developed a metric which we will refer to as “Square Footage per Accredited Professional” or “sft/AP”. The table below provides a summary for sft/AP for the three building rating systems. Note: Accredited professionals under IGBC are referred to as IGBC-AP, and under GRIHA are GRIHA-Evaluators. For purpose of our discussion, we will refer to the generic term “AP” for the three different rating systems. As the table above highlights, there is a significant difference in the sft/AP value between USGBC-LEED, IGBC-LEED and GRIHA. The sft/AP value for IGBC-LEED is 25 times the similar value for USGBC-LEED. Similarly, sft/AP for GRIHA is 8 times the sft/AP for USGBC-LEED. What this implies is that there are too few APs in India compared to the total square footage of certified green building space. This is a cause for concern. We believe that unless more and more stakeholders in India’s building sector invest in developing a cadre of professionals who are familiar with the advantages of green buildings and understand the requirements of such projects, the growth of green buildings in India might not be able to meet its potential. In particular, we feel that accreditation for operations and maintenance (O&M) personnel is important. The reason for this is as follows: At present, LEED for new construction contributes to a majority of the certified green building space in India. If green buildings have to deliver on the promise they hold related to operational performance, effective O & M by skilled personnel will be the key once the building is commissioned and handed over to the end users. This in turn will lead other stakeholders to take notice and this will help in development of regulations, tax incentives, financial products, etc. to promote green buildings. This will ultimately provide the much needed catalyst for the next phase of growth for the green buildings market in India. 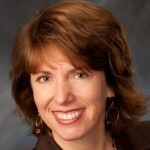 Not just numbers, diversity of professions could matter, too! The Green Building Certification Institute (www.gbci.org) has the option to filter the APs by profession or by the sector to which they belong. Using these filtered searches, we discovered, not surprisingly, that the majority of the APs (over two thirds) were architects, and quite a few were civil engineers. But we also noticed that there were around 1,300 facilities management professionals, almost 200 APs who are municipal officials/code reviewers, around 160 professionals from financial institutions (including insurance companies), nearly 600 educators, and a few even from the press or media. Considering that there are close to 180,000 USGBC APs (as of February 2012), some of these numbers might appear insignificant. But our premise is that involvement of all stakeholders is important for the development of the green building market. In this context, we wonder whether the investment made by organizations and their employees in training and certification has helped in the growth of the green building market in other countries of the world, particularly the United States. We conducted a similar review for the IGBC Accredited Professionals and GRIHA Evaluators. Though the IGBC website does not list the professions of the APs, we looked at the organizations with which these professionals are associated. A random scan of these organizations indicated that the majority of these organizations are from the architect, consultant, developer, and contractor community. A few are equipment or service providers (including Schneider Electric! ), or real estate consultants. We see a similar pattern in case of GRIHA evaluators, though the major difference is that quite a few of the evaluators are from government organizations, including the Central Public Works Department. This could be so because the Government of India has mandated that all new buildings housing government offices or those of public sector undertakings shall be GRIHA certified. (GRIHA was developed jointly by The Energy Research Institute and the Ministry of New and Renewable Energy, Government of India.) Overall, there are very few APs from the finance sector, municipal officials, academia, and R&D in India. In our next post, we will discuss further the role that different stakeholders can play in the development of the green building market in India. Until then, we would welcome comments and feedback from you. Interesting aspect ! What about the location of the AP’s ? Excellent piece. very interesting and informative. Would love to read more. Good analysis. It would be good to map periodic evolution of sft/AP metric of USGBC LEED system and the impact of rating specific accreditation on the quality of delivery of rated buildings. Look forward for next article. 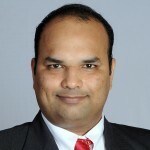 Dear Amresh , Excellent article ,keep the good work going ! You are working on a important aspect of this century and you will add immense value to this proposition .Good Luck !!! Reg. location of AP’s – There is a recent study by Accenture that gives the break up of USGBC AP’s by geography that can be found via an internet search.In India, the metro cities have the highest concentration of IGBC AP’s. Reg. profession of AP’s: Not every USGBC LEED AP has provided their profession since this is probably optional information that needs to be submitted. We have based our comments on the voluntarily reported data. In case of IGBC AP, one can guess that an AP working in an Architecture design firm, for example, would most likely be an Architect. However, we did not want to base our comments on such guesses (even though they might be reasonable in most cases). Therefore, we have discussed with the type of organization the AP works for.